If you are a regular reader of our blog, you know we love all things lime. When I saw Pinch My Salt’s Coconut Lime Cake, I immediately bookmarked the recipe. I knew I had to try it. Joshua had a meeting the other day, so it was the perfect time for me to bake him a cake. I usually don’t bake cakes because it is just the two of us, but I knew Josh would devour this one and I was right. He loved it! The cake was moist with a tender crumb. The cake part was really good, but the glaze is what made it shine. The lime flavor was perfect, not too tart, just right. The dusting of coconut also made it a very pretty cake. When Josh got home, we enjoyed a piece of cake for dessert. Pure bliss! I will be making this one again. That looks delicious!!! I’ve been wanting to make something like this for a while now, definitely bookmarking the recipe! I love the lime too – such a refreshing flavor!! And of course it’s meant to go with coconut – classic pairing!! Potential birthday cake for my Josh for next year! Looks great! Love the coconut. That sounds delicious and so full of yummy flavor! I love coconut and lime together. I especially love coconut cakes! What a great combination of flavors. I think I’ll makes this for my birthday! YUM!! I’ve been on such a coconut/lime kick lately and I can’t wait to try this! Thanks for sharing! This looks fantastic Maria.. absolutely delicious!Lime coconut can not go worong! Can never go wrong with lime and coconut. Nicely done! Now that sounds and looks so tropical! I’m am all about coconut lately – I think it’s the combination of Spring and Easter! This cake looks wonderful! Yummy it looks amazing! I’m making this for our next gathering for sure, I can’t wait! I rarely bake cakes for the same reason as you, but this looks like I may have to make an exception! I love coconut cake, I bet the addition of lime is delicious and cuts some of the sweetness. This sounds absolutely delicious and it looks gorgeous too! that sounds delicious! i’m allergic to coconut, but i could easily go for just a lime cake. mmmm. The coconut and lime combination is very hard to resist. The cake looks heavenly. Yum! This sounds great. I am such a big lime fan. Much more than lemon for some reason. This looks like a perfect springtime dessert. Love the combo of the lime and coconut can’t wait to try looks great. So yummy looking and a good combo. If you like cakes, but don’t want to make a whole one, you should look into mini pans. They’re awesome for small batches! Thanks everyone! The lime and coconut combo is divine! Sugarlens-A lot of exercise, we eat healthy, and we share our treats! Esi-Thanks for the tip. I will look for the mini pans! moist. so moist. and so much coconut. i do love this, maria–thanks for sharing! Maria this looks awesome! It look like a rich cake but with the coconut and lime I bet it was delish! That looks pretty dang tasty!!! Yum!! This looks SO yummy!! This looks wonderful, and you know I’m always looking for new ways to use buttermilk! 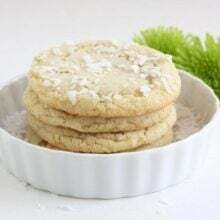 🙂 And I am a believer in that coconut/lime combo after making Dorie’s coconut butter thins. This cake looks fabulous! It’s absolutely beautiful! I love lime and coconut together. The glaze sounds awesome. Oh I love lime too and this coconut lime cake looks so refreshing just like spring we have here in the u.k. Beautiful combo of flavours Maria. Hey Maria! We were in Clearwater Beach, which is on the Gulf Coast…I think Palm Beach is on the Atlantic coast, so the other side of Florida. It will be beautiful there though I’m sure! When we went the weather was *perfect*! Enjoy your vaca.! 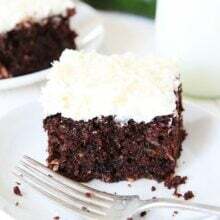 Yum, I love coconut and this cake sounds so good! Yours looks so moist! Kristen-Thanks for the info! Glad you had a fun trip. I can’t wait to go to the beach! A wonderful combination! I love coconut and lime! So exotic! Your so sweet always baking something for Josh! He’s gonna get chubby! 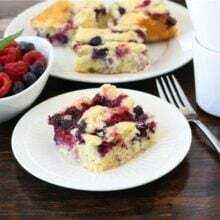 I love the look of this cake and the recipe sounds wonderful. Thanks for sharing! This is a keeper, you can see how moist it is!! This looks great…I’ve been craving lime and coconut cake/pie!! May have to try this soon! wow that looks amazing– such a great summer dessert, so refreshing! It looks so refreshing and tropical! yum! I made a Florida Pie from Dorie Greenspans book Baking. It was wonderful so I can imagine the flavors in that cake. This is a keeper! That looks heavenly! You had me at moist and tender! Beeeeee-utiful! I bet I could eat the whole thing too! Mmmmm, this is the third blog I’ve seen this on and it looks even better the third time around! Mmm, coconut and lime are the perfect combination… and perfect for spring. OH…YUMMY! I will definitely be trying this one! It’s so pretty too! I didn’t see it on PMS, but I bookmarked it here! Totally making this, probably next week when I’m in town at my Mom’s. It will be the perfect thing to make together! She reads your blog btw! Mmm, this cake does look totally divine. I love lime and coconut together. And that glaze sounds FABULOUS. Man, I wish I could’ve come home and gotten a piece of this cake, too. Lucky Joshua! oh that coconut cake looks sinful! This does look delicious. Beautiful cake, Maria! Ummm, like a fluffy cloud of coconut! Nicole was one of the 1st blogs I started reading…good eats – great gal. It’s beautiful – what a fantastic flavor combination! I’ve being looking for a good coconut cake since last week (fb and twitter included!!) I finally found it!!!! That looks so good and I love that it’s not slathered in a thick, fattening frosting! I really like the sound of this coconut and lime cake! My daughter made this cake today,it is so good,between the three of us(husband included).We finished half of it.It is pretty awesome.It is definitely a keeper!! i love coconut and lime together! Wow.. this is looking awesome. I will try to make it today, very very thanks for recipe. i sent to my daughter in law ans she made this for my birthday, i must say we all LOVED it…it is everything you said and then some.. I made these as cupcakes for my sister’s birthday 2 days ago. I used gluten-free flour and since I had no flaked coconut I just put in 3 tablespoons of coconut flour and subbed some coconut oil for some of the butter. On top of the glaze I put a heavy cream-ground lime zest-icing sugar frosting and then candied lime slices. They disappeared. Thank you! I made this cake last night for a Cinco De Mayo party at work today and it was fantastic! Everyone was raving about the cake and how they had never had anything like it before. It had a light texture and wasn’t too sweet like I was expecting. The lime flavor really came through (definitely use freshly squeezed lime juice) and the coconut was a great addition on the top. It was easy to make as well! I just made a double double recipe for Fathers’ Day and all four cakes turned out great! We live in Costa Rica at altitude so I had to adjust the baking time a bit, but they turned out very much like the picture. Thanks for the great recipe! what will be a good cake flour to buy? and can i try this without the coconut?